The end of the world. Doomsday. The Apocalypse. Judgement Day. Armageddon. The end of days. No matter what one calls it, one cannot deny that the human race has a morbid obsession with predicting, envisaging and romanticising the end of life as we know it on Earth. Poets have written about it, musicians have sung about it and directors have brought their visions of apocalyptic destruction to the big screen. Now it’s time for this most final of events to be captured in the transportive medium of perfume – so if one isn’t quite content with merely reading about or watching visions of the apocalypse, it’s now possible to smell the end of the world. It will come as no surprise then, that the brand behind this olfactory representation of death and destruction is none other than Etat Libre d’Orange – the very same people that bottled the unforgettable (no matter how hard you try) smell of bodily fluids (Secretions Magnifiques); the squeaky clean, leather-clad bear (Tom of Finland); and the odour of filthy hotel sheets (Putain des Palaces) – so in reality, scenting the apocalypse is rather tame for our good friends over at the Orange Free State. The perfume is called ‘La Fin du Monde’ (The End of the World) and is intended as Etat Libre d’Orange’s olfactory take on the most final of all events – the apocalypse. But what exactly does it smell like? Well, as with anything these punky purveyors of perfume pop art do, this smelly doomsday isn’t what one would expect and the signature ingredient the brand has opted for is surprising, intriguing and more than just a little bit baffling – popcorn. That’s right folks, in the weird and wonderful world of Etat Libre d’Orange and the mind of perfumer Quentin Bisch, the apocalypse smells just like popcorn. Popcorn is an odd choice and one that the brand doesn’t really explain. For this blogger the link appears to be inspired by our love for apocalyptic movies. From the high octane disaster action of Armageddon to the dream-like manic depression of Lars Von Trier’s Melancholia, us willing movie goers have spent many an hour glued to the silver screen, scoffing down bags of popcorn and watching the world burn. This is La Fin du Monde. The popcorn accord in La Fin du Monde is immediately recognisable. The stale, sweet and musky smell of cinema snacks is omnipresent but abstract enough not to be entirely evocative of bags and bags of popcorn. The most surprising thing about it is its overall subtlety, in the sense that it is both quiet in volume and in statement, meaning that one can wear it without feeling as if one is covered in sickly sweet kernels of savoury goodness. In terms of death and destruction though, La Fin du Monde doesn’t entirely deliver. One will find no blood and guts, no catastrophic explosions and a distinct lack of adrenaline-pumping fights for survival. It does however, have a flinty, mineral aspect to it that feels like cold stone, almost as if the key image created here is of piles of cold grey rubble. Lurking amongst this rubble is solitary blades of vetiver, softly burning in the embers of what used to be buildings – monoliths of the old world. Carrot and orris add a rooty and vegetal sense of cold that floats free of the popcorn and rubble, creating an added sense of depth and hinting at something rather unsettling. La Fin du Monde definitely isn’t as bold a statement as many of Etat Libre d’Orange’s other scents, instead opting for a warm, understated and autumnal vibe similar to the one found in Like This (Tilda Swinton in a bottle) rather than the shock value pop art of the brand’s many other offerings. It’s also relatively linear with a slow burning development that wears very close to the skin, meaning that what one has when one first sprays is pretty much what stays throughout the fragrance’s lifespan. All-in-all La Fin du Monde is an interesting little curiosity. The popcorn accord, despite already being used in Serge Lutens’ Jeux de Peau, is joyfully novel and surprisingly wearable when combined with the fragrance’s more flinty aspects. That said, it doesn’t quite convey the promised vision of the apocalypse, instead merely hinting at doomsday carnage. But perhaps that’s the intention, and one would be a fool not to note the subtlety of hand here, and subtlety from a brand that is not used to such an approach lest we forget is definitely intriguing and refreshing. 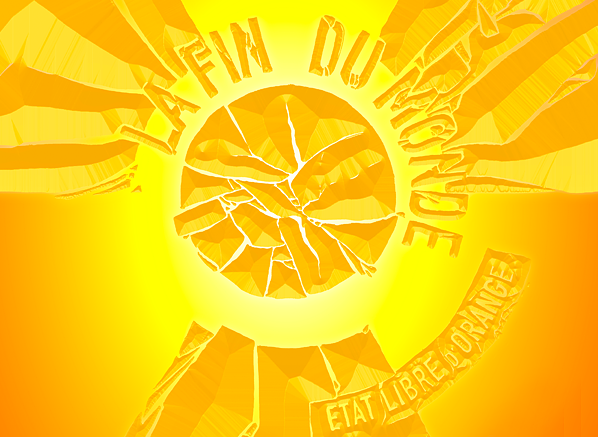 Whatever their intentions with La Fin du Monde, Etat Libre d’Orange continue their reign as one of perfumery’s most renegade brands. They do not fear the weird and unpleasant, in fact they actively embrace it, and it’s this fearlessness that makes for such enjoyable, thought provoking and wearable perfumes. 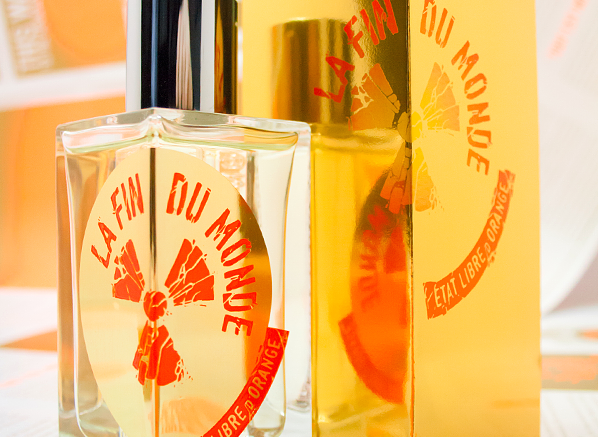 So if you’re not content just watching the end of the world on TV, why not grab a bottle of La Fin du Monde, spritz on a healthy dose and let the perfume take you on a journey. Whether you’ll find chaos and destruction or a popcorn oddity is all down to your nose’s imagination. The competition is now closed. Thank you to all who entered and join us in congratulating Susan, Ali, Kristen, Caleb and Freddie! We have 5 x 50ml Etat Libre d’Orange La Fin du Monde Eau de Parfum sprays to give away ahead of next week’s launch, simply let us know your favourite fragrance note in the comments below to be in with a chance! Competition ends on Friday 8th November. This entry was posted on Thursday, October 31st, 2013 at 11:20 am and is filed under Candy Perfume Boy, Fragrance. You can follow any responses to this entry through the RSS 2.0 feed. You can skip to the end and leave a response. Pinging is currently not allowed. Tangerine, fig, caramel, honey, patchouli – there’s simply too much to choose from! :)) I love perfumes. I’m a real olfactory freak and it would be a first for me to sniff that pop-corn accord. I’m actually really intrigued by it! In this one ‘popcorn’ but normally pumpkin or ginger! Great review, Thomas. Looking forward to trying another new one from ELdO! Wow sounds like a great fragrance! I love vanilla and amber! Sandalwood… Rich,sweet,balsamic…The classic oriental woody note & profoundly spiritual. Ambrette absolute! Absolutely!!!! I love how brave they are with perfumes!! Popcorn was a weird choice for sure, and it’s tame texture is kind of what I was dreading – but then you sold me with the flint 😉 haha. They have to have metallic in there somewhere right?! Patchouli as in Nombril Imense and Iris as in Nirmal. I haven’t tried this— but I’m reserving hope that popcorn will be my FAVORITE note. Why not? “Like This” made me love ginger and immortelle. Cuir de Russie made me love iris and leather. Why can’t popcorn be my next love? Dying to try this. ELdO never disappoints. incense, vanilla and ambergris – thanks! I like Patchouli! I love that stuff! As to the ‘why’ behind the use of ‘popcorn’ as a note, a little further research on the inspiration behind La Fin du Monde’s composition helps make it a little less ‘baffling’. Apparently the main inspiration for the composition & name was a 1919 surrealist protofilmic novel (tho’ first developed as a screenplay !) by Swiss/French poet & author Blaise Cendrars, with the full title of : La Fin du Monde, Filmée par l’Ange Notre-Dame (The End of the World, Filmed by the Angel of Notre Dame). An antiwar satire describing God’s decision to destroy life on earth due to human’s warlike nature. And in which this ‘end of the world’ is surrealistically depicted as a film (kind of) depicting a cosmic cataclysm, then followed by a reversal, or ‘rewind’, to life as it was pre obliteration. AND much thanx for the giveaway !! love this post, would love to try this interesting popcorn accord! my fave notes are sandalwood, iris,violet and tea. Any perfume with an incense note has all to be at least pleasant to me! well i love fat electrician, i dont know which note in it I love. but there’s some sweet and dessert dry feel to it…. it might be the opoponax. Thanks for the giveaway! My favorite note is orris although I’m intrigued as to what popcorn accord smells like! greetings. a creamy sandalwood is my fav note in a fragrance. peace. At the moment I am into Vanilla. Sandalwood and vanilla are particular favourites of mine. My favourite scents at the minute are Ambre Sultan and CDG’s Kyoto. Eldo’s are not available in Ireland!! At the moment I’m very much into Vanilla. My favorite fragrance note is tuberose! Thanks for the draw. At the moment it’s iris, cream, milk. Other times lavender, incense, cocoa. Vetiver is a longtime favorite accord; its grassy coolness hums. I am recently adoring it in DS & Durga’s Cowboy Grass, as well as in Josh Meyer’s The Soft Lawn (Imaginary Authors.) Diff Co’s Sel de Vetiver was an early love. Rei Kawakubo’s especially deft with it in CDG Black. And Dawn Spencer Hurwitz uses it brilliantly in her Cuir et Champignon. I would love to spend time with the warm vetiver in ELdO’s La Fin du Monde. My note preferences are constantly changing. I love the wet rose in Portrait of a Lady… the creamy vetiver of Fat Electrician… the sweet golden musk throughout Musk Kublai Khan… the smokey licorice lingering around CdG Black… it all depends on the day, how loud I need to be, how grey the sky is. My group of favourite notes change and oscillate all the time but I’d say that the top ones are iris, musks, sandalwood, patchouli, cardamom, cumin, ambergris… Right now maybe musk as a singled out note. Thanks for the draw, count me in! Thanks for the review! At the moment my favorite note is rose; I’ve been wearing Rossy de Palma for the past three days and finding it delightfully disturbing. Love ELdO.